Jairam Ramesh said the Congress had faced "electoral crisis" from 1996 to 2004 when it was out of power. 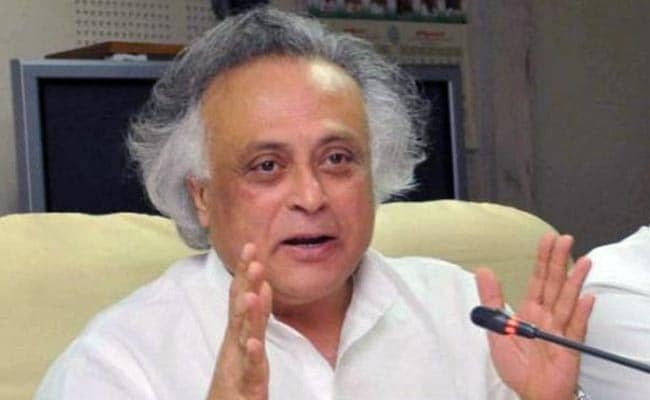 Jairam Ramesh said the Congress party was facing an "existential crisis"
The Congress is facing an "existential crisis", senior party leader Jairam Ramesh said on Monday and pitched for "a collective effort" by party leaders to "overcome" the challenges it faced from Prime Minister Narendra Modi and BJP chief Amit Shah. Mr Ramesh also said that business as usual approach will not work against PM Modi and Mr Shah and advocated for flexibility in approach to make the Congress relevant. Taking jibes at party leaders who still behave as if the party is still in power, he said: "The sultanate has gone, but we behave as if we are sultans still. We have to completely redo the way of thinking, the way of acting, the way of projecting, the way of communicating. I think there is a lot of goodwill for the Congress, a lot of support for the Congress but people want to see a new Congress. They don't want to see old mantras, old slogans. We must recognise this is a big challenge. Huge challenge for us." He said the Congress had faced "electoral crisis" from 1996 to 2004 when it was out of power. The party had also faced "electoral crisis" in 1977 when it lost the elections held soon after the emergency. "But today, I would say that the Congress is facing an existential crisis. It is not an electoral crisis. The party really is in deep crisis," he said, when asked whether the threat of "poaching" of MLAs posed by the BJP in Gujarat had forced the party to transport its MLAs to Karnataka to ensure party leader Ahmed Patel's victory in the Rajya Sabha polls. He, however, justified the Gujarat Congress's decision to send 43 of its MLAs to a resort in party-ruled Karnataka on July 29 to fend off the alleged "poaching" attempts by the BJP, saying the BJP had also "transported" MLAs in the past. He said it was wrong for the Congress to think that anti-incumbency will work automatically against the Modi-led government in the states being ruled by the BJP in the elections. "We have to understand we are up against Mr Modi, Mr Shah. And they think differently, they act differently, and if we are not flexible in our approach, we will become irrelevant, frankly," the Congress leader said. He said the Congress must also recognise that India has changed. "Old slogans don't work, old formulas don't work, old mantras don't work. India has changed, the Congress party has to change," he said. The former union minister hoped that party vice-president Rahul Gandhi would end the uncertainty over his taking over as the Congress president to make the party ready for crucial electoral battles in key states in 2018 and the Lok Sabha polls scheduled a year later. "I think in all probability, Rahul Gandhi will take charge (as Congress president) before the end of 2017," he said. The senior leader lamented that he had been proved wrong in the past about his prediction about Rahul Gandhi assuming charge of the top party job. "I thought it will happen in 2015, it didn't happen. I thought it will happen in 2016, it didn't happen. So I am the wrong person to ask this question. I feel that it may happen before the end of 2017," Mr Ramesh said. He said he had "no" indication about appointment of Rahul Gandhi as Congress president. "I have only expectation. That's all. In 2018 and 2019 you will be busy with elections. State elections, national elections...and this type of thing...uncertainty is not good," he said and urged the Gandhi scion to "finish it off." Asked if there is anyone in the Congress party to give a strong challenge to PM Modi in 2019 elections, Mr Ramesh said, "I have always maintained that it is the collective strength of the Congress that will overcome Mr Modi not some individual magic wand". "It has to be a collective effort," he said. Mr Ramesh also said Nitish Kumar's return to the NDA fold was a big setback for anti-BJP coalition in the country, describing it as a "completely betrayal of the mandate" given to the Mahagathbandhan or Grand Alliance by the people of Bihar. Mr Ramesh, who shares a personal rapport with Mr Kumar, said, "personally, I was aghast, astonished, deeply disappointed, but we have to move on and we don't have time." Mr Ramesh, representing Karnataka in the Rajya Sabha, expressed hope that the "revival" of Congress will happen in Karnataka next year as it had happened 40 years ago in 1978 in Chikmagalur Lok Sabha seat in the state which gave political rebirth to Indira Gandhi who faced defeat in Rae Bareli in the elections held after the Emergency.